Calm returns to Maiduguri Airport after protesting soldiers seized it – Royal Times of Nigeria. 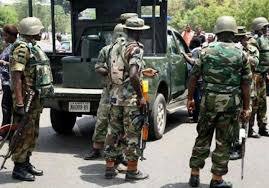 The Nigerian Army says calm has been restored at Maiduguri Airport seized for two hours on Sunday by riotous troops, that it described as ‘unscrupulous”. A statement by Colonel Onyema Nwachukwu, Deputy Director Public Relations, Operation Lafiya Dole Theatre Command informed that the protest by the few unscrupulous troops happened while the command was conducting a redeployment of soldiers at the Maiduguri Airport, following a directive to review troops deployment in Maiduguri metropolis, to reinvigorate the security architecture of the city. The aggrieved soldiers had claimed they have overstayed and were resisting redeployment to Marte, one of the towns liberated by the military several years ago from the control of Boko Haram terrorists.